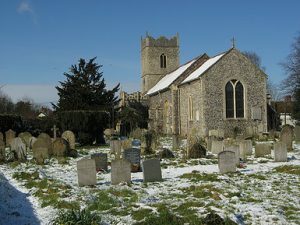 In 1901 when Clementine, Lady Montfort was a young mother with three young children in the nursery it snowed that Christmas Eve as the Talbot family and their servants walked down St. Bartholomew’s church in the village for the evening carol service. I remember from my own childhood that nothing captured the spirit of Christmas quite so powerfully as singing carols in our local church. 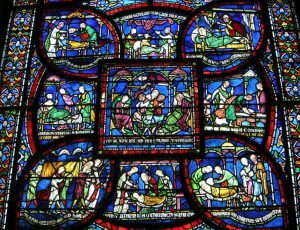 It was an ancient building with a square Saxon tower and a wonderful ring of bells, and it’s stained-glass windows were simply beautiful when they were lit by candles. 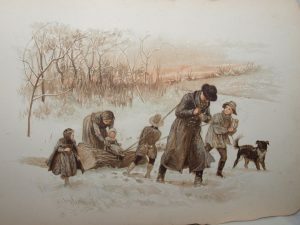 Those old stone walls were not enough to keep out the cold of winter and the central heating was particularly poor –it had been installed about forty year’s earlier. But by the time we had reached the end of all six verses of ‘Once in Royal David’s City’ we were all quite warmed through. After we had sung our carols we walked home to log fires and mince pies with brandy butter and a glass or two of sherry. 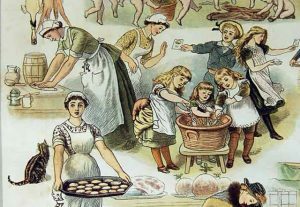 So what was Christmas like in Edwardian England? I promise you it was a good deal simpler than it is today! Queen Victoria’s husband and consort Prince Albert had brought German traditions to England several decades earlier: Christmas trees, trimmed with pretty colored glass ornaments, ribbons, toys and sweets and lit by candles. But the English tradition of figgy pudding and mince pies, of halls decked with evergreen were still very much in place. As was bringing in the Yule –a giant log to burn in the fireplace was still an important custom in the country in 1901. 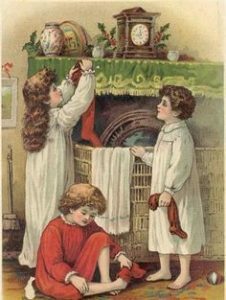 With Christmas trees came Christmas stockings, from another old German tradition when St. Nicholas rewarded good children with sweets and gingerbread in their shoes (set out for the night) or coal if they had been naughty. 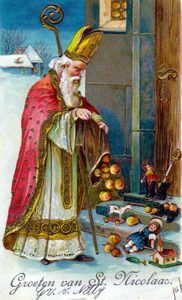 And just as we do today, on the night before Christmas, Lord and Lady Montfort played at being Father Christmas (the English name for Santa Claus) by putting toys for their children under the tree –unwrapped because there was no such thing as gift wrap then! 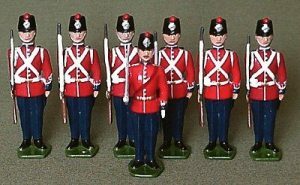 Brightly colored lead toy soldiers for boys were popular Christmas gifts, as were dolls and doll-houses for girls. When Harry, Althea and Verity were asleep Lord and Lady Montfort crept into the nursery and put their heavy stockings at the foot of their beds and then they laid out their Christmas presents under an immense tree in the great hall of Iyntwood house. The days before Christmas were busy ones for Iyntwood’s housekeeper, Mrs. Jackson, as she supervised the footmen in decorating the house. 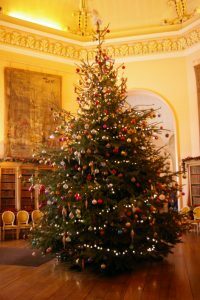 The great hall, the dining room and drawing rooms were festooned with evergreen garlands of ivy, yew, laurel, mistletoe and holly. 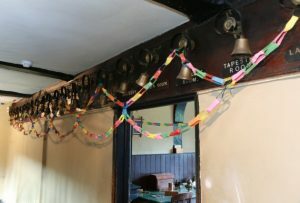 Downstairs in the servant’s hall the housemaids sat around the servant’s hall table with a cup of tea and made brightly colored paper chains to string across the rooms below stairs. The only preparations made well in advance of Christmas were those in the kitchen. 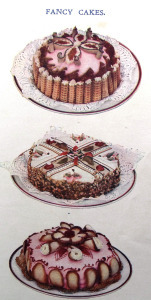 Christmas cakes made with dried fruit and skewered all over and fed a steady diet of port, whiskey or brandy were made weeks before and kept in cake tins. 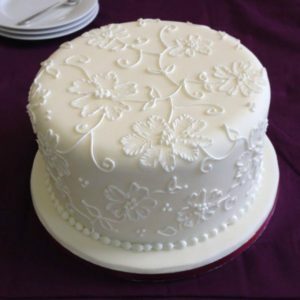 They were then covered with marzipan and hard royal icing, as smooth as fresh snowfall, and decorated with crystalized fruits or glass ornaments for tea on Christmas day. 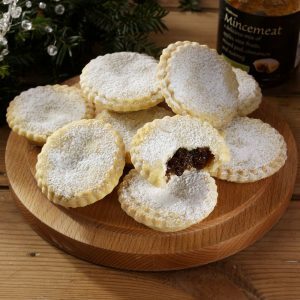 Mincemeat for mince pies and the plum puddings (sometimes called figgy pudding, and these days Christmas pud) were made on or immediately after the Sunday before Advent, four to five weeks before Christmas. On Stir Up Sunday Harry, Althea and Verity came down to the kitchen and wrapped in big white aprons each took turn to give the pudding mixture a thorough stir and to make a wish as Mrs. Thwaite, the cook, emptied silver tokens and coins into the pudding batter to bring wealth, good luck and thrift in the coming year by the person whose serving included them. And on Christmas morning Harry and his sisters wake awfully early just as our children do today to unpack their stockings when it is still too dark to see anything really well and eat their Christmas oranges. 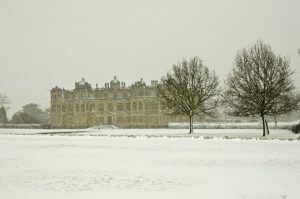 After breakfast on Christmas day the snow is now quite deep when Lord and Lady Montfort leave their children making a snowman (with half the servant’s hall to help) and drive to church for the morning service and afterwards to go to the Rev. Bottomley Jones’ Vicarage for a glass of sherry. 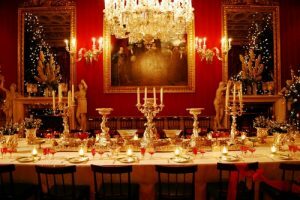 And while they are there their servants celebrate their own Christmas below stairs with roast goose and a flaming plum pudding and brandy sauce. In the early afternoon the Talbot’s neighbors and close friends arrive at Iyntwood, and the servants work harder than ever. 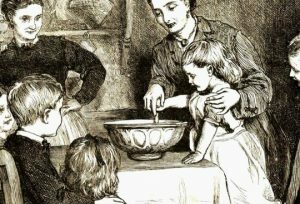 At half past four on the dot all the children in the house dressed in their very best Sunday outfits, with their faces scrubbed and their hair neat and tidy come down from the nursery to join the grown-ups for tea in the drawing room. They are a little in awe of the company and are on their very best behavior! Tea is a feast of delicious creations: tiny sandwiches, brandy snaps filled with cream, mince pies with brandy butter, jellies shimmer in exciting shapes and there is ice-cream. The Christmas cake on its silver stand looks as enchanting as the snowy world outside the windows. Excitement mounts when the butler, Mr. Hollyoak, comes in to announce that the Christmas Tree is lit –he has arranged for a couple of buckets of water to be hidden in a corner of the hall just in case there is a mishap. The family and their guests walk out into the hall. 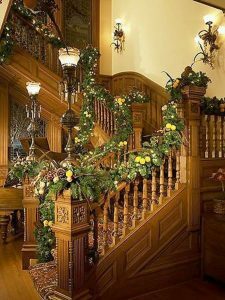 And there towering in the stair well and sparkling in its candle light is the magic of the Christmas tree and underneath it are presents for everyone. 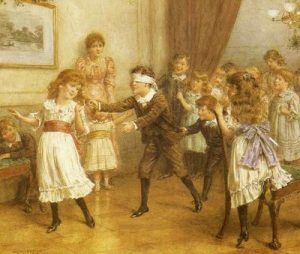 Then it is back to the drawing room to play parlor games: blind man’s buff, pass the parcel, hunt the thimble and musical chairs. 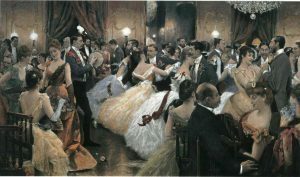 The grownups drink champagne and join the games until nannies arrive to take the children up to the nursery. 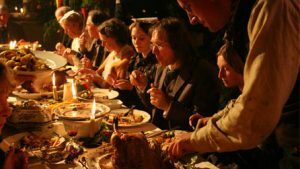 Iyntwood’s Christmas dinner is renowned throughout the county. 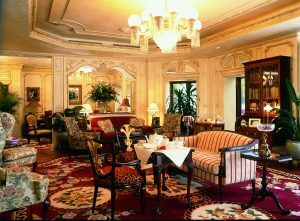 The table in the great dining room easily seats forty and shines in the candlelight with ornate displays of white roses, holly, ferns and ivy. The scent of hothouse lilies fills the air and silver and crystal gleam and sparkle in the candlelight. 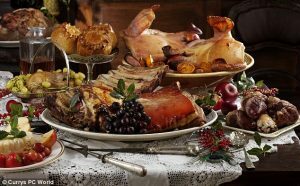 Course after course is served with delicious wines culminating in a procession led by Hollyoak of footmen bearing a great boar’s head, surrounded by tender slices of succulent roast pork, on a silver tray. After dinner the children clutching their new toys, their eyes sleepy force themselves to stay awake as they watch the dancing through the bannisters from upstairs. A very merry Christmas to all of you from everyone at Iyntwood!